There is nothing quite as refreshing as a chilled slice of tangy, lemon meringue pie. 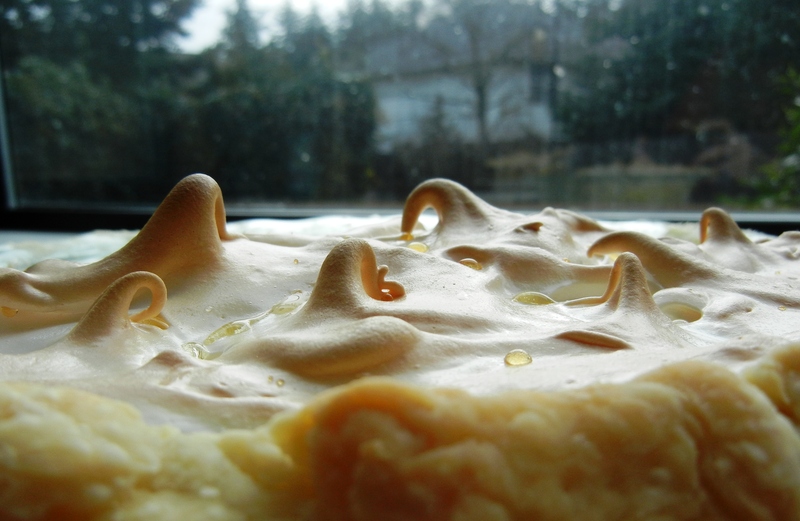 A slice of Lemon Meringue Pie for breakfast brightens up a grey, rainy Northwest morning. Lemon Meringue Pie is the perfect dessert, whether following a light luncheon on a hot summer’s day or a rich, five course meal. It is no accident that three of my friends made it their dessert of choice for Christmas dinner. You would have thought that after a meal of prime rib, twice-baked potatoes, crescent rolls, ambrosia salad, and butternut squash, we would have not been able to manage dessert. But that’s the beauty of the versatile Lemon Meringue. It has the capacity to make you feel lighter after a full meal and is the perfect refreshment, whether served with a hot cup of coffee or a glass of chilled, sparkling Prosecco. For years, I used my mom’s traditional recipe, but always thought I could improve upon it (Sorry, Mom!). 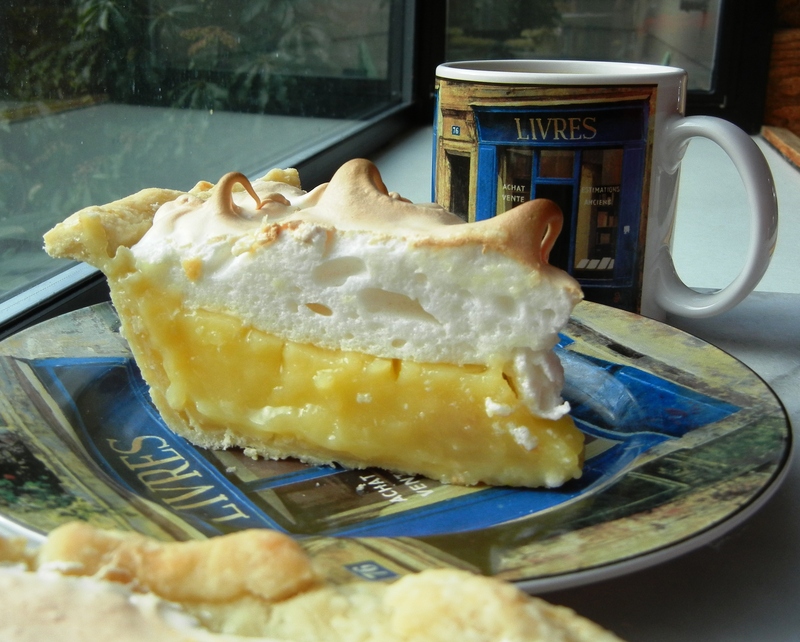 I love a deep, lemony filling and a hint of vanilla in my meringue. My original recipe, below, has more filling than most and is sure to please lemon lovers. Enjoy! 1. Set out eggs and butter and bring to room temperature. 2. 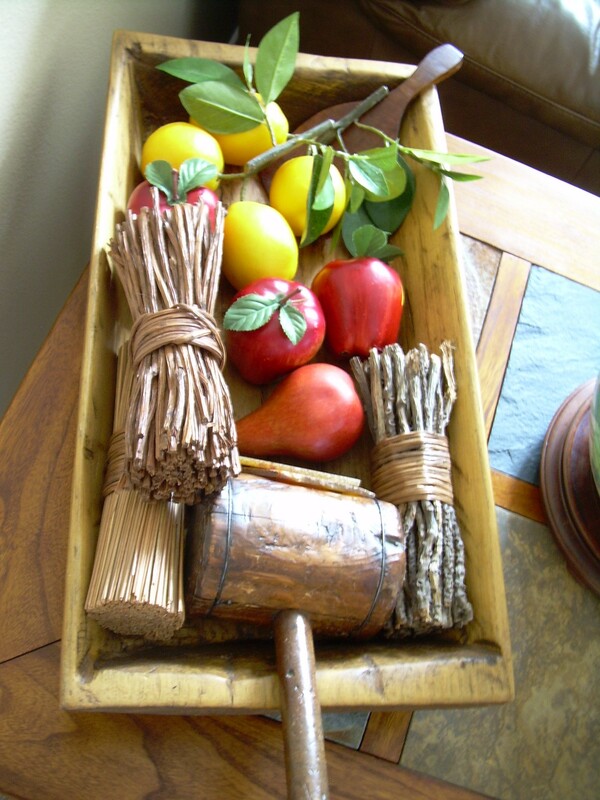 Prepare a single pie crust using your favorite pie crust recipe, in a 9-10″ deep dish pie pan. Prick holes on bottom and sides of crust with a fork. Bake at 425° for 12 minutes, or until lightly golden. Remove baked pie shell and place on cooling rack. Reduce oven temperature to 35o° and adjust oven rack to the middle position. 3. While pie crust is baking, grate lemon peel until you have 1 Tbs. Next, roll lemons on counter to release juices inside. Juice lemons (3-5, depending on size) until you have 3/4 c. lemon juice. A bit of pulp is fine. 4. Separate egg yolks from the whites of 5 eggs. Put whites into a medium mixing bowl and yolks into a small, heat proof bowl. Beat egg yolks slightly with fork. Set aside. 5. Prepare meringue, following directions below, so that you are ready to spread it over hot pie filling. In a mixing bowl, combine room temperature egg whites, vanilla, and cream of tartar. Beat with an electric mixer on medium speed until soft peaks form. Gradually add in sugar, 2 Tbs. at a time, beating on high-speed until stiff, glossy peaks form and sugar dissolves. In a large saucepan, whisk together sugar, flour, cornstarch, and a dash of salt. Over medium-high heat, gradually stir in the 2 1/2 c. water, a little at a time, to avoid clumping. Continue to stir and cook until thickened and bubbly. Reduce heat, cook and stir for an additional two minutes. Remove from heat. Gradually whisk hot filling into the beaten egg yolks until about half the filling is added. Return all to saucepan, stirring continuously. Bring to a gentle boil once again. Add butter and stir until melted. Remove from heat. Add zest and slowly stir in lemon juice until fully integrated. Pour hot filling into baked pastry shell. Spread meringue over hot filling, taking care to seal all the way to edges of pie crust to prevent shrinkage. Use the back of a spoon to draw meringue up into peaks or, try my technique, swirl and lift using your pointer finger. Place pie on center rack and bake for 12 minutes at 350° oven or until meringue is a golden, toasty brown. Watch carefully to make sure meringue doesn’t burn. Cool on a wire rack. Slice when completely cool. Store at room temperature. *There are forums on the web to address what some consider the issue of a “weeping” meringue. Some eschew covering or refrigerating the pie. 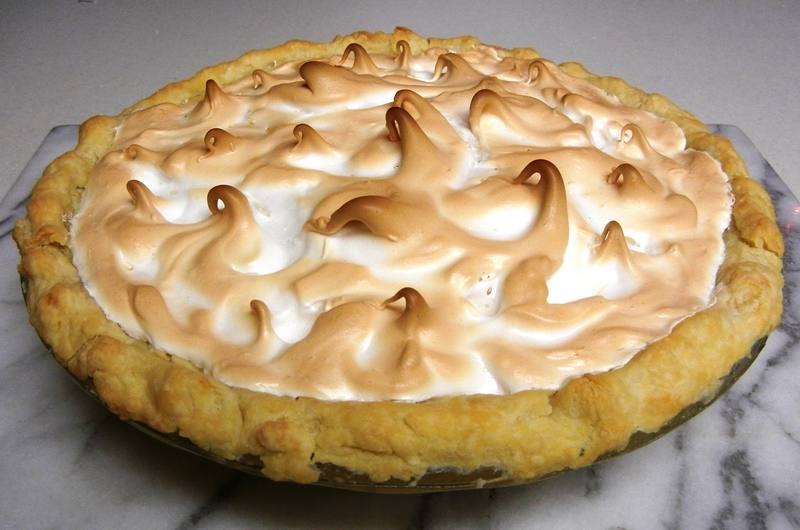 If you must cover though, pinch foil into a tent and place over pie so as not to touch meringue. Personally, I don’t worry about a meringue that weeps. As a young girl, the little drops of golden nectar that formed in the nooks and crannies of the snowy peaks and valleys fascinated me. I thought their amber beads added beauty and mystery to the meringue. Guess the perfect meringue is in the eyes of the beholder! What do you think? Does a weeping meringue represent tears of joy or tears of sorrow? Share your tips and techniques for baking this classic American dessert! Later in the afternoon, we visit Nonna and her husband, who has not been well. In spite of how hard she works to care for him, Nonna greets us at the door looking elegant as usual. 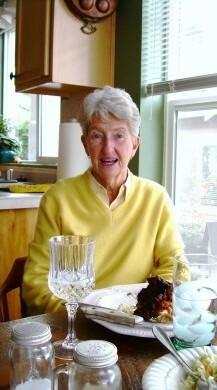 Today she is stylishly dressed in a lemon yellow V-neck cashmere sweater and buttoned-down Oxford shirt. It was almost as if she knew that in addition to fried chicken, cole slaw, and potato salad, we brought the rest of our Lemon Meringue Pie for dessert! We had a lovely visit full of laughs and, of course, lemons.